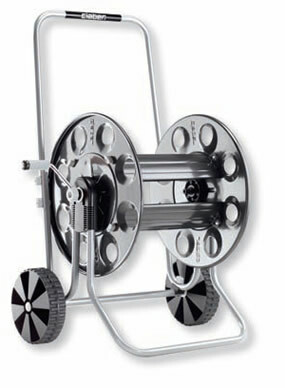 The Gemini Hose Cart comes in kit form, and is easy to assemble without the use of tools. Constructed entirely of metal, it has lifetime resistance thanks to its epoxy resin paint treatment, making it resistant to the Great British Weather. This unit comes fitted with silent-block preventing the wear of metal on metal. Large size wheels make the handling easier even when loaded with up to 130m of 1/2" hose pipe.